Peel ‘n Neat solves the problem of keeping valuable surfaces pristine at every stage—in handling, after pallets are broken for sale, and while installers do their work. Rick Kapres, sales V.P at Versatex Building Products, LLC, states, “Peel ‘n Neat solves the problem of keeping these valuable surfaces pristine at every stage—in handling, after pallets are broken for sale, and while installers do their work." Versatex Building Products, LLC is introducing a new packaging option designed to keep PVC trimboards clean during transport, storage and installation. 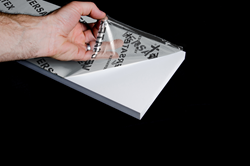 Called Peel ‘n Neat, it’s a tough, clear film that can be factory-applied to 5/8", 4/4" and 5/4" boards, 4" through 16" wide, in 18' lengths. “Peel ‘n Neat solves the problem of keeping these valuable surfaces pristine at every stage—in handling, after pallets are broken for sale, and while installers do their work. After trying it out under real-life conditions, we’re making it available to all of our contractors, distributors and lumberyard operators,” states Rick Kapres, V.P. at Versatex. Weather-resistant, long-lasting VERSATEX trim materials and systems are manufactured by Versatex Building Products, LLC, of Pittsburgh, where state-of-the-art facilities produce cellular PVC extrusion products such as VERSATEX trimboards, sheet, T&G, moldings, prefabricated corners, and one-piece column wraps; the innovative VERSATEX soffit system; dimensionally compatible VERSATEX Max nominal 2-by boards; and the Canvas Series, which pairs the beauty of wood with the durability of PVC. Details are posted at http://www.versatex.com.